Brooke Bloom, Keith Nobbs, and David Greenspan. Photo by Theresa Squire. BOTTOM LINE: Brooke Bloom and Keith Nobbs give strong performances in David Greenspan's at times confusing memory play. Helen Twelvetrees, a film star of the early talkies in the '30s, is largely forgotten today. David Greenspan saw a photograph of her and was so fascinated that it prompted him to write this drama, which isn't a biography so much as a memory play. Greenspan plays many characters, including an alter-ego teenage version of himself, sixteen-year-old Mike, who sets out to find the actress in 1951. He follows Helen (Brooke Bloom) to a Long Island summer stock theater where she is playing Blanche DuBois in A Streetcar Named Desire. The play cuts between 1951 and scenes of Helen with her two husbands Clark (Keith Nobbs), who died in a street brawl, and Conrad (Greenspan). Scenes are often repeated with slight variations. This shows how unreliable memory can be, but it also leads to some confusion. It's not always clear whose perspective we're following and it doesn't help that Greenspan also plays all the other secondary characters. If you prefer straightforward narrative, this play might be frustrating, but if you are willing to go along with the fluid structure, there is also a lot of beauty and lyricism to be found in Greenspan's language. Bloom is captivating and believable as a star of the silver screen and Nobbs channels the torture and pain of a man struggling with his sexual identity. I personally found their story more engrossing than the one about Mike, but that would have been a different play. 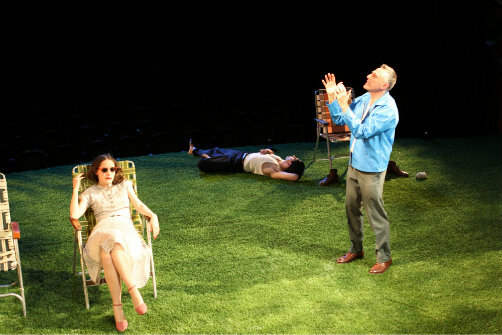 Leigh Silverman's staging places the audience in risers on the AstroTurf stage (designed by Antje Ellermann), staring out into rows of empty seats behind the action. It has a gorgeous effect, especially when Helen stares out into the audience at one point during the play. It's a fleeting moment, just like theater and our memories.